The North KPA said that its frontline troops had moved into a "fully armed, wartime state" in line with the wishes of leader Kim and ahead of the 5:00 pm (0830 GMT) deadline on Saturday. South Korean troops stood at maximum alert on Saturday with North Korea threatening to go to war unless Seoul meets a looming deadline to halt loudspeaker propaganda broadcasts across the border. The North Korean People’s Army (KPA) said on late Friday that its frontline troops had moved into a “fully armed, wartime state” in line with the wishes of leader Kim Jong-Un and ahead of the 5:00 pm (0830 GMT) deadline on Saturday. “If so, South Korea must have a firm, strong, and timely response to signal its resolve that it will not be intimidated. Anything less would be an invitation for further provocation,” he said. 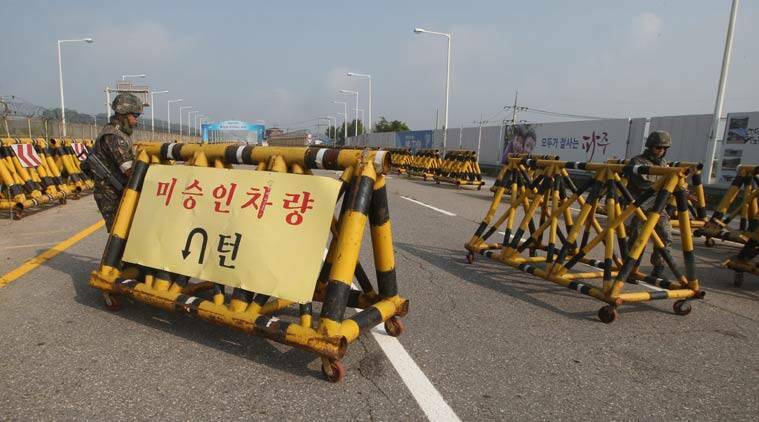 For the moment, there has been little sense of panic among ordinary South Koreans who have become largely inured over the years to the North’s regular- and regularly unrealised- threats of imminent war. Technically, the two Koreas have been at war for the past 65 years, as the 1950-53 Korean conflict ended with a ceasefire that was never ratified by a formal peace treaty. The last direct attack on the South was in November 2010 when North Korea shelled the South Korean border island of Yeonpyeong, killing two civilians and two soldiers. Kim’s order on Saturday to move to a war footing came after an exchange of artillery fire on Thursday that claimed no casualties but triggered a dangerous spike in cross-border tensions. Tensions were already running high over some mine blasts earlier this month that maimed two South Korean border soldiers, and the launch last Monday of an annual South Korea-US military exercise that infuriated Pyongyang. Despite Pyongyang’s subsequent denials, South Korea said the North was behind the blasts and responded by resuming propaganda broadcasts across the border- a practice both Koreas had ended by mutual consent in 2004. The move outraged the North, which eventually issued its 48-hour ultimatum for the South to turn off the loudspeakers by Saturday afternoon, or face military action.